Home announcements Apple iPhone 4S iPhones News Special Offers Get Up To $49.01Discount For iPhone 4S And 4 - Apple Retail Stores Matching Prices! 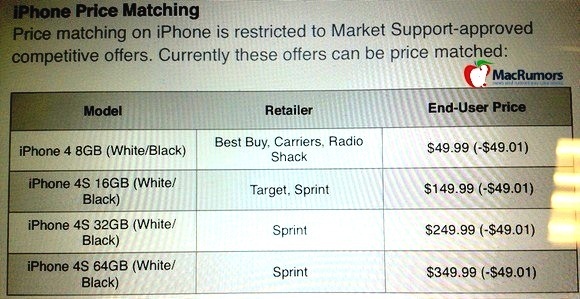 Get Up To $49.01Discount For iPhone 4S And 4 - Apple Retail Stores Matching Prices! With the suggested new iPhone release date to be September 12th, number of retailers and carriers are beginning to drop prices on the Apple’s existing smartphones. However, standard on-contract pricing of $199/$299/$399 for the iPhone 4S, $99 for the iPhone 4, and free for the iPhone 3GS has been strictly maintained by Apple. If you happen not to be hindered by the approaching introduction of the iPhone 5 and still intend to buy an iPhone despite all of the signs pointing at early September release date, there is some good news for you. 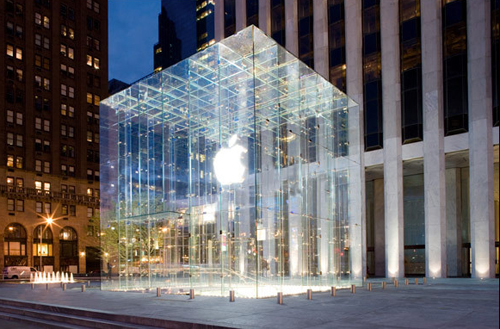 Apple's retail stores are now offering to match the prices at major carriers and retailers, as the source has told MacRumors today. If you check the picture provided by the same source, you’ll notice that Apple stores can take up to $49.01 off of the iPhone 4S and iPhone 4. Remarkably, the price corresponding policy relates only to Apple's retail stores and is not available for orders via the online store. What the customers are required to get the discount is to cite the source offering lower price tag for the same iPhone model – this is for Apple to honor the price match.